THIS IS A CUSTOM MADE WIND UP MUSIC BOX! IT HAS THE WIND UP KEY ON THE BOTTOM, YOU NEED TO WIND IT UP FIRST, THEN LET IT GO AND IT PLAYS THE SONG OVER AND OVER FOR ABOUT 1-2 MINUTES! This post includes 1 wooden music box with the carving on pic 1 on it with your choice of color and song! Any further ideas, please convo me! The music boxes approximately measure: (W x D x H): 3 in x 2 3/4 in x 1 3/4 in! 7,6 cm x 7 cm x 4,5 cm and they're made of maple wood. HOW TO ORDER: - choose a color (see pic 3) - choose the song - choose if you'd like to add a short personalization to the bottom of the box (max 15 characters, like a date with your initials see pic 4) and leave me a note - add to cart. List of available songs: A dream is a wish your heart makes, Amazing Grace, Ave Maria, Baby mine, Brahms Lullaby, Butterfly Kisses, Canon in D, Clair de Lune, Davy Jones Theme, Edelweiss, Fur Elise, Greensleeves, Happy Birthday, Hedwig's Theme, Here comes the sun, I just called to say I love you, Jesus loves me, Over the rainbow, You are my sunshine, What a wonderful world. 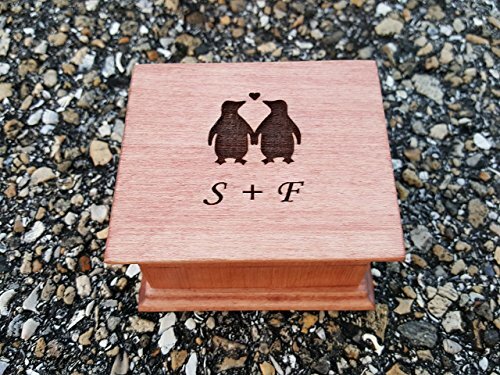 With the different motifs and melodies they're suitable for any occasions: birthdays, baby showers, Valentine's day, family reunions, graduations, Mother's day or as bridesmaids gift, maid of honor gifts, mother of the brides gifts, ring bearer gift, thank you gifts or get well gifts as well! If you'd like to place a custom order, please keep that in mind that it takes up to 4-6 business days to get a music box done depending on the song of your choice and my work load! But even if you don't have that much time, contact me and I'll try to work it out! If you have any questions about this product by Simplycoolgifts, contact us by completing and submitting the form below. If you are looking for a specif part number, please include it with your message.